Loveland, Colo., June 8, 2012: Interweave announced today the opening day of sales for its annual Hurt Book Sale, with savings up to 70 percent off during this annual five-day event. 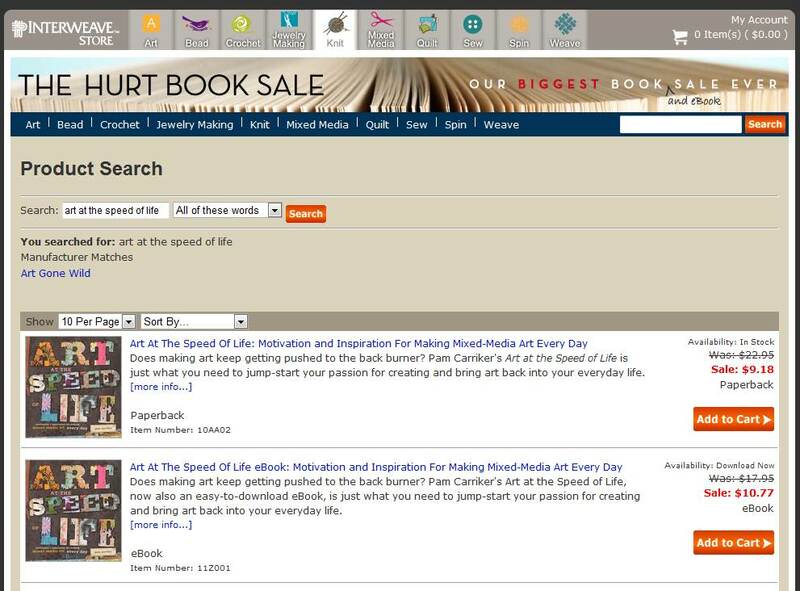 More than 400 art and craft resources will be deeply discounted and sold online on a first-come basis during the Hurt Book Sale, beginning today through 11:59 p.m. MDT on Tuesday, June 12. This is Interweave’s largest online book sale ever, with deep discounts on backlist and recently published books on the topics of drawing, painting, quilting, beading, jewelry making, knitting, crocheting, felting, spinning, weaving, needlework, sewing, mixed-media and other popular arts and crafts. EVEN my book, Art at the Speed of Life has been ‘hurt’:-( Doesn’t it just make you want to pick it up, take it home and care for it?! Read some of the excitement on Twitter and Facebook around last year’s Hurt Book Sale on Storify: http://storify.com/hurtbooks/hurt-book-sale-chatter. “We love hearing our customers brag about the deals they snag each year,” adds Malzahn. This year’s sale will also feature bundled deals on a variety of products, which will be announced to the company’s e-newsletter subscribers and on the Interweave Books’ Facebook page.Hurt and overstock books can be combined with normal products at check-out. Interweave’s Hurt Book Sale is for online customers only and no phone orders will be accepted. Thanks for the link, Pam. This is always a great sale–and I didn’t realize they have a Facebook page. I can’t click into the ADD TO CART click even when I click into the “can’t click onto” option. I click and nothing happens. I want to buy a hurt copy of Art at the Speed of Life. And there’s no phone # to call. Please help. I went and fixed the links so you can click on the image of the page with my books or my book title to purchase it:-) Thanks for the heads up that it wasn’t working! !